PORTSMOUTH’S first ‘Boris bike’ scheme could be hosted in a refurbished church building. Funding from the national Church of England will help worshippers to repair and refurbish St Margaret’s Church in Eastney. The church is being allocated around £350,000 from the national C of E to transform the building. St Margaret’s Church in Highland Road was closed in 2015 because it was unsafe. Its roof leaked, its windows needed repairing, and there was a danger of plaster falling from the ceiling. Former worshippers held their final service in its church hall in December 2015, as they were unable to use the church building. Two years later, a new congregation – including 15 core members from nearby St Jude’s Church, Southsea – started worshipping regularly in that church hall. That ‘church plant’ has now grown to around 70 regular worshippers, and it needs more space. They have already invested around £90,000 into some initial work on the church building. Their vision is that the refurbished St Margaret’s Community Church will be at the heart of its local community, with the building being used as a base for entrepreneurs and social enterprises. This extra funding will allow the church to host a community café, regular community activities and youth events. One of the social enterprises – Bicycle Recycling – has already created a workshop within the church building, where young people are being trained in bike maintenance. Bicycle Recycling accepts donations of unwanted bikes and recycles them for sale in its shops in Portsmouth and Gosport, or sends them to Africa. It also provides employment opportunities for young people who can learn retail and repair skills. Now it is paying for some of the internal refurbishment at St Margaret’s Church, so it can be used as the operational base for a project to provide 150 loan bikes across the city. It wants to start a scheme similar to the one created by Boris Johnson as Mayor of London, with bikes available at prominent locations across the city. 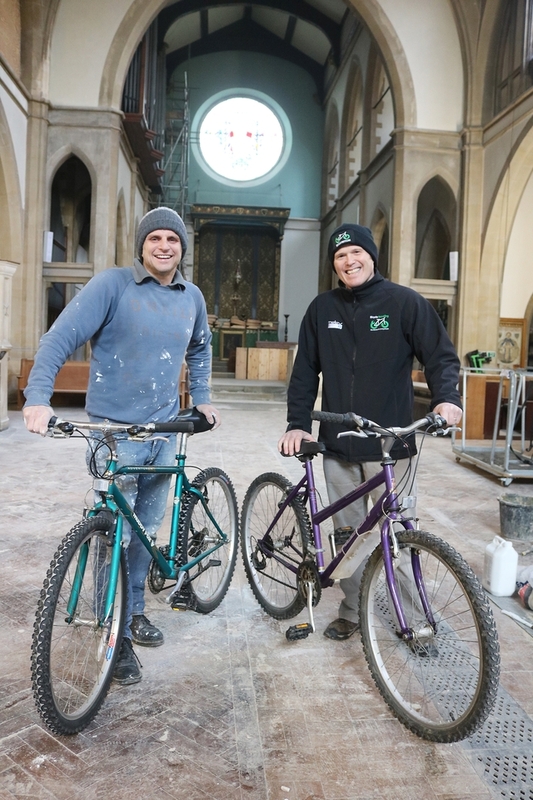 Bikes could be picked up and dropped off at a number of key spots across the city – and brought into St Margaret’s Church for repair when needed. The loan bikes scheme would be a partnership between Bicycle Recycling, Portsmouth City Council, St Margaret’s Community Church and the firm NextBike, who run similar schemes in Cardiff and Exeter. It could be launched this Spring. Charlie Adie, managing director of Bicycle Recycling (pictured above, right, alongside church leader Fran Carabott), said: “We would start off with 15 drop-off points for bikes in the south-west of Portsmouth, including key places like The Hard, the Seafront, Commercial Road and Albert Road. We’d have 150 bikes available for people to pick up, make their journey, and leave at the next drop-off point. “At any time we might have 10 per cent of the fleet being maintained at our base in the church. We’ve already created a workshop at the side of the main building, with six workbenches, and we’re offering opportunities to young people to learn about bicycle maintenance. Since the autumn, teenagers from Highbury College have been coming here regularly as part of their courses, and we also take young people on work experience. And Fran Carabott, who leads St Margaret’s Church as its lay pioneer minister, said: “When we started meeting in the church hall in September 2017, there was no way we could use the church itself. There were two big cracks in the wall, and plaster could have fallen from the ceiling onto us. And 100 years of sea breezes on the south-facing windows had disintegrated the stonework around the windows. “We’ve already invested some money in repairing the ceiling and re-felting the roof. This new funding will now help us to create a new worship space, prayer room, kitchen, office space, toilets, and ‘hubs’ on either side of the church for social enterprises to use. Their rental income will help the church’s ongoing costs. 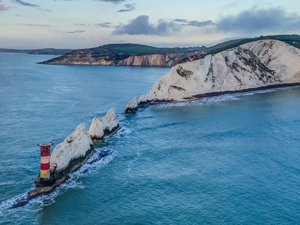 The national Church of England announced on January 23 that £2.1m has been allocated to projects in Portsmouth diocese as part of a total allocation of £35m in Strategic Development Funding across the country. As well as the funding for St Margaret’s Church, some of the £2.1m will go towards the employment of two pioneer ministers at St Luke’s Church in Southsea. Those ministers will support its work with teenagers and young adults, and on developing working spaces for lone workers and entrepreneurs. 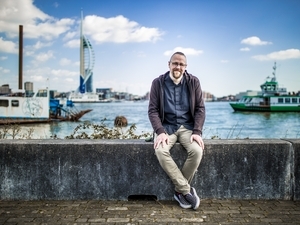 Harbour Church in Portsmouth will also receive support to consolidate its work in two new city congregations, within St George’s Church, Portsea, and St Alban’s Church, Copnor. The funding is part of the national Church of England’s Renewal and Reform initiative to enlarge congregations, deepen discipleship and enable churches to have a greater impact on their local communities. The Ven Joanne Grenfell, Archdeacon of Portsdown, said: “It is great news that the national Church have chosen to support these projects to help us have more spiritual impact in the city of Portsmouth. I’m particularly impressed that C of E churches throughout the city – which are often very different to each other in the way they choose to worship – are so supportive of each other’s visions. The Diocese of Portsmouth originally applied for £4.9m in Strategic Development Funding from the national Church of England, which would contribute towards its £9.65m initiative to revitalise church life across the diocese. On the advice of the national C of E, its bid was split into two parts. This first bid, for projects in the city of Portsmouth, has been successful. The second bid, which includes new initiatives in the Leigh Park estates, the town of Newport, and the centre of Gosport, is still being considered.